Safe Kids, Smart Parents one what’s this all about? When your children were very little did you ever take them to the beach or to a pool? Remember what it was like the first time? Most likely you set them down equipped in life preservers or Floaties and stayed right next to them as they stuck a toe in the water. Or maybe your kids are little right now and you are just getting ready to introduce them to a wading pool, buying them that preserver along with sunscreen. The next time you return to the pool they might be a year older and a year wiser, perhaps you will stand back a bit more, maybe even have a casual conversation with the person standing next to you. As the years go on and you visit the beach or pool, most children will increase their competency and confidence near and in the water. Many will have been taught to swim. They will have been reminded repeatedly not to swim right after eating, not to swim out too far, not to run alongside the pool’s edge. They’ve learned lessons, mastered skills. Before you know it you will pick up a magazine and finish a whole article as your child plays in the water. It’s not that you don’t care or worry about your child, it’s just that you have begun the process of letting them grow up. They have shown you that they have the skills to handle a situation they really couldn’t handle before. At some point you can even sit down and read a whole chapter undisturbed. The progression happens steadily and slowly. You already know that you are a good parent. You already know your kids well. But there are some tough subjects facing kids and families these days: abduction, exploitation, abuse, social media, bullying, and survival, among others. These subjects can be hard to talk about and you may want a little help. Sometimes parents and caregivers think this “tough stuff” is too scary to talk about. But what are the facts? How do the experts tackle these subjects? In this book, we will give you the knowledge and tools to understand and talk to your kids and your family about safety; abduction, exploitation, social media, marketing, and other complex subjects facing kids today. By addressing these big subjects with your kids, you will provide them with an opportunity. This can be an opportunity for your children to learn, to practice acting like an adult while you are there to help, an opportunity for them to think things through. Just like taking them to the pool, over time they will show you that they have the skills to handle various situations. It takes time and it takes repetition, but little by little they will understand and learn. By beginning to talk about these things when your kids are little, you are preparing them for the future. Your kids can learn to adapt to new situations safely and wisely and how to bounce back quickly from problems. By honestly addressing difficult topics, they can learn some very important critical-thinking skills, like how to analyze situations and then make good choices in response. By discussing circumstances running from the most extreme to the much less severe, you can equip your children to safely face a complicated world. Here’s my promise: You can teach your children tools and techniques to give them power in challenging situations. You can teach your children how to be strong and how to protect themselves, and you can do it without using fear or threats. And while you teach them, you will develop a closer, more trusting relationship with them, and your child will be able to understand and safely manage the bigger world. Thirty-five years ago in a small town outside of Boston my sister and I had a friend who disappeared. No one talked about it. All we knew was that she was gone. We would drive by her house on the way to school and silently speculate about what had happened. I was haunted by the thought of her beautiful blond ringlets and her infectious dimples. She had been the definition of perfection in my mind. A few years later it happened again. A childhood camp friend disappeared. I was old enough then to remember rumors of an upsetting story, possibly a familial abduction gone awry, or maybe even the work of a serial killer, but again, there was no forthright discussion in our house or in the community. Instead, there were rumors and a silent acceptance of the girl’s disappearance. Questions were not encouraged, answers not given. Perhaps it was a symptom of fear; discussing the unbelievable, the terrifying, might make it happen. But, as parents, we have a responsibility to discuss these difficult topics with our children. All kids need reliable information. Yes, of course, how you talk about tough topics differs with a child’s age, but, again, all kids need information. That is just common sense. In 1993 a sociopath career criminal took twelve-year-old Polly Klaas from her bedroom in Petaluma, California. Most of the young people in the surrounding communities were aware of what had happened. The media covered her kidnapping extensively, sharing both facts and rumors. Sifting through both, preteens and teens struggled to figure out what had occurred and what might have prevented the tragedy. Most of these young people wrestled also with overwhelming feelings of powerlessness and extreme anxiety and finally settled on an attitude of acceptance toward the unlikely and unimaginable. Surprisingly, few parents connected their child’s heightened anxiety with Klaas’s abduction. When, two months after her abduction, a man was arrested and confessed to killing Polly, many wanted to put the tragedy behind them. It seemed like everyone wanted to isolate the event, and deny that it might impact their own families. The reverse in fact happened: fear of talking about such a sad and scary event stifled real conversation. Many of the kids wrestled alone with their feelings. Recently, an editorial ran in a local paper written by a young woman still living in the community from which Polly Klaas was abducted. This young woman recently learned all the facts surrounding Polly’s disappearance. She writes that, despite all the time that has passed, it was useful for her to learn the facts surrounding Polly’s disappearance because it clarified some of her parents’ protective behavior toward her when she was a child. She added that once she understood the roots of her parents’ fear she was finally able to make sense of her own fear of the dark. Why did she have to wait until adulthood, however, to learn the truth? She wisely suggests that children need age-appropriate information about significant events in their neighborhoods to help them understand their parents’ actions and reactions. Children need to have an accurate understanding of the events that directly impact their community and the adults around them. Sometimes parents and adult caregivers struggle with how to explain complex and frightening events to children. Most parents struggled with what to say after the terrorist attacks of 9/11. What was too much, and what was too little? What would help, what might harm? Most of us concluded that something had to be said so that children could understand the shell-shocked faces of their parents and the adults they interacted with. Knowledge, the right sort explained in the right way, was essential to help kids of all ages deal with the facts and images of that shocking day. Helping parents and kids talk about uncomfortable topics—from abduction, sexual abuse, and exploitation to shocking events, whether local or international—is a goal of this book. And that begins with . . .
Sixteen years later, a young woman named Jaycee Lee Dugard ended up in my care. She is a survivor of an abduction that lasted eighteen years. We have spent hours of work together trying to sort out what it took for her to survive her experience. We have reached the conclusion that no one can truly predict the outcome of these tragic situations. But the subject must not be avoided. Parents need to talk with their children in an honest and appropriate manner. They need to find ways to communicate facts, concerns, inevitable uncertainties, and ways to deal with them. Children, too, need to give voice to their fears, to be provided with reassurance, and to learn how to find answers to their questions. As is true for most important topics relating to children, parents can’t avoid talking about them just because it is difficult. Indeed, a parent’s willingness to communicate openly and to revisit a tough topic as often as necessary is the first step in making such talks less difficult. As this book will explain, the most important part of communication is to look and listen to what you are communicating even as you look and listen to what your child is communicating back to you. Love and the skills of communication are the gifts you can give to your child by showing them the way you deal with these frightening, overwhelming, and unimaginable subjects. Managing the feelings, the discussion, and the actions surrounding subjects like abduction will provide them with tools they can carry into life. These tools can make the worst-case scenario less likely; they can help a frightened kid be a little less scared, an uncertain child more confident. The most powerful weapon with which you can arm your child is the certainty of your love, and preparing your child to confront the world safely is just one of the many ways you can convey that love. Which is why my sister and I firmly believe that addressing these difficult topics in creative, empowering ways might be the most important conversations, and the most meaningful, you and your children have. Elizabeth Bailey, MSN, RN, CRNP is a nurse practitioner, and a graduate of Hampshire College and Santa Monica College. She worked previously as a associate producer on TV and movies for 20th Century Fox and Disney, but now lives with her family in Los Angeles. 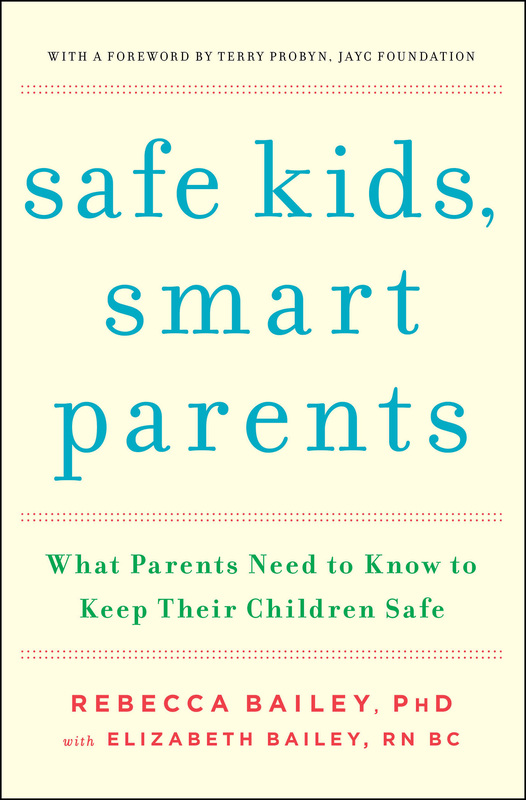 "An invaluable and essential resource for parents and children that couldn’t be more timely"
“Safe Kids, Smart Parents is marvelously subtle, powerful, and straight forward. Pushing "safety, awareness and communication" always, it's not the standard how-to or rule book; rather a thought process book, beautifully written. With love and concern, it skillfully coaches parents, giving them the knowledge and ability to deal positively and effectively with their children’s questions, and keep them safe. “Every parent must read this book. It teaches how to help your child cope with the reality of predators while building self-confidence and avoiding unnecessary fear. Follow the Baileys’ essential, wise, and practical advice to reduce the risk of exploitation, abduction, and victimization. The life you save may be your child’s"
"[Safe Kids, Smart Parents is] not to be ignored." "Family psychologist Bailey affirms that the ultimate goal of abduction and exploitation awareness is not to induce paranoia, but to make children feel loved, and for parents to trust that their kids are making safe choices... Bailey's communication strategy suggests a proactive approach and will help parents build the kind of trust that will encourage kids to speak up."